From mid-June to mid-July, we spent a month back in Florida, visiting with family, friends, and also a number of churches in the Florida conference. Both Alison and I found it an incredibly humbling experience to hear people share that they are praying for us and the ministry here at East Belfast Mission. We are grateful for all of these prayers, along with the expressions of care toward both us and our children that we experienced in different places. During this time of sharing and also vacation, we found that our sense of call to be in Belfast for this time in our lives was renewed. I am sure that part of that is due to the ways that people interacted with us and the prayers that were offered. All this being the case, we are eager for these type of relationships not to be ‘one-way’, but are happy to be remembering you in prayer as well, whether or not you are part of one of the above congregations. Please share with us if there is a way that we can remember you. 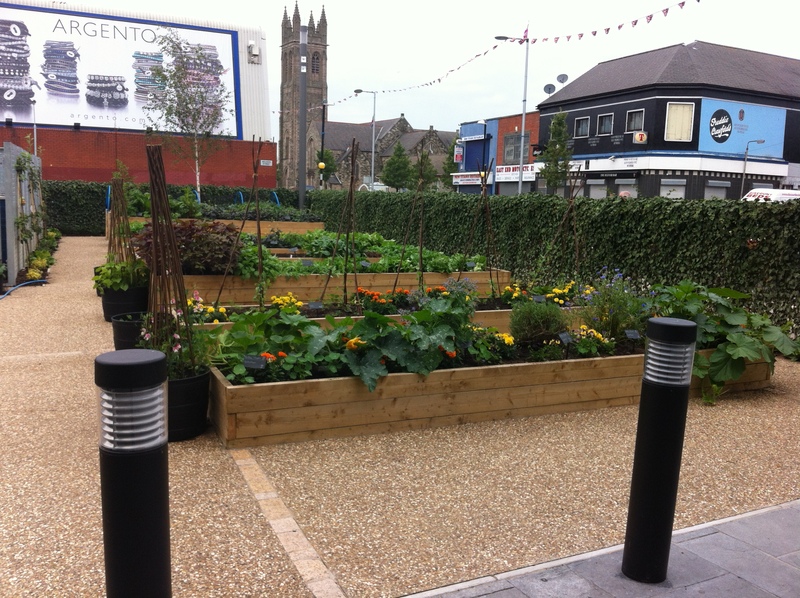 state of the community garden at East Belfast Mission. When we left in mid-June, this area was a blank slate – boxes that were filled with soil but seeds had not yet been planted. Due to a team of people that has been caring for this space, along with unseasonably warm weather(! ), the month was an outstanding month for growth, and we were greeted last week with the following view, along with a bunch of bok-choi to add to a salad. This garden is one further witness of hope to a community that has just experienced another flare-up of violence as the ‘parade’ season was at it’s height last week. Pray that as people tend this garden – some of whom are new to EBM – that relationships would deepen and hope would be stirred in both them and the surrounding neighbourhood.